Serious and sometimes life-threatening injuries can exist in your very own backyard. As you clean up from winter’s havoc, start spring home improvements and keep up with everyday yard work, watch out for these most common hazards. Any time your lawn mower is running, it requires your full attention. From the moment you start it in the garage or shed, make sure windows and doors are open to avoid carbon monoxide poisoning. Most importantly while doing yard work, keep all children off and away from mowers, and keep an eye on older adults mowing. 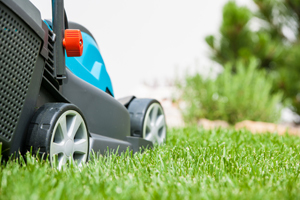 The majority of lawn mower injuries happen to children younger than 15 and adults older than 60, according to the Johns Hopkins Bloomberg School of Public Health. Know the area you’re about to mow. Walk the terrain first to look for debris or obstacles that could impact your mower or tractor. Debris could also kick up from the blades, so wear long pants and closed-toe shoes when mowing. Using a lawn mower with a grass-collecting unit can help prevent small objects, such as stones, from hitting you. Be especially careful on slopes, turns and near roadways. Most tractor fatalities are caused by overturns. Keep hitches low and always on the drawbar to avoid tractors flipping over. It sounds obvious, but read your mower’s manual to understand all of its safety features, and never leave it with the engine running. Be mindful of your fingers anytime you’re operating chainsaws or hedge trimmers. It’s the No. 1 casualty of cutting tools, and doctors typically see an increase in patients following thunderstorms, hurricanes and other natural disasters, when these tools are used to trim fallen trees and branches. With this in mind, cutting tool operators should not wear gloves, because gloves may become bulky or slip, causing operators to lose their grip. They should wear long pants, shoes and even safety glasses or goggles to protect from airborne debris or rocks. Cutting tool operators should also check power and extension cords regularly for damage to avoid electric shock. Children should be kept far away from these tools at all times, even if the chainsaw or hedge trimmer is off. The sharp blades can just as easily cause injury when not in motion. Falls are the leading cause of unintentional injuries. Before climbing a ladder, inspect it. Look for loose screws or rungs before climbing. Also be sure to wear slip-resistant footwear. Where you place the ladder must also be taken into consideration. Make sure it’s on a firm and level surface, and not in front of a doorway that would swing open to hit the ladder. If it is in front of such a doorway, make sure it is blocked or guarded so it will not hit the ladder while you are on it. When on the ladder, ask someone to stand at the base to spot you to make sure you’re not at risk for falling. In addition, remember the three points-of-contact rule: Keep your two hands and one foot on the ladder or one hand and two feet on the ladder. In addition, always face the ladder. While we encourage safety, we know injuries can happen at any moment. That’s why our experienced team is here to help. Contact one of our skilled attorneys 24/7 for Results You Deserve.